I already wrote a blog on Booking a Private Tour in El Nido, but the gist of it is: if you want to make the most out of island hopping, you’ll want to do a private tour rather than a public group tour. It’s worth spending a little extra money to get a whole boat to yourself, because you get way more space, aren’t stuck to a schedule, can leave the marina earlier than any other tour boats, you can get WAY better photos, and it’s just overall a nicer experience. If you’d rather make your own schedule, take a look at my blog about how to book your own tour in El Nido. Since we were on a private boat, we were able to choose the order of islands we visited, so Big Lagoon was our second stop of the day around 9am, hoping to arrive before the other boats. We ended up being the FIRST boat to arrive, so we had the lagoon to ourselves for around 30 minutes before more boats pulled in. Dom sent the drone up into the sky to capture some beautiful aerial shots, and I hopped in a kayak to start exploring the lagoon. You can hire kayaks from the entrance to the Big Lagoon for 300 PHP (roughly $6 USD), so split between two people and it’s pretty cheap and well worth it! We paddled through the lagoon admiring the steep limestone cliffs until it became too busy for our liking, so we made our way back to the boat and set off for our next stop, Secret Lagoon. I’m not going to bother writing much about Secret Lagoon, because in my personal opinion it is unbelievably overrated. Our guide told us that Secret Lagoon is a cool lagoon where you need to climb through a small opening in the rocks to access it, but what he didn’t tell us was that the lagoon is so small that a line forms, and I kid you not, there were 100 people waiting in it. If that’s a specific stop on your tour, you’re better off skipping the lagoon line and heading towards the beach to the far right, because it’s far more peaceful and will give you beautiful photos without making you feel claustrophobic! Snake Island was our lunch stop for both boat tours we did, and you HAVE to go to this island. My jaw literally dropped when we pulled up, because not only is this spot gorgeous, but it looks like you’ve been transported to my dream destination of Tahiti. If you don’t believe me, take a look at the photos! Snake Island gets it’s name because it’s essentially a winding sandbar that stretches out from Vigan Island, and is the most picture-perfect backdrop for the gourmet seafood lunch you get on your boat trip. There are beach dogs waiting for you to pull in, and have taught themselves to swim out to the boats in the hopes of getting some free seafood, so you might end up with a dog on your boat! We spent about an hour there floating around, flying the drone from the sandbar, looking for starfish, and just soaking up the sun. Pro tip: ask your boat captain if you can visit Snake Island at the beginning of low tide so you can walk along the sandbar! That lunch was one of my most memorable moments of my entire trip to Palawan, so I highly recommend you don’t skip it. 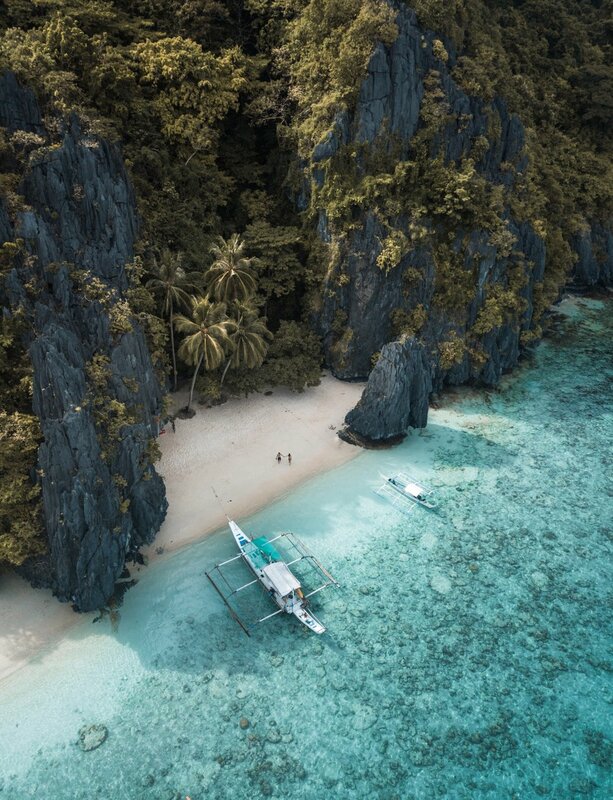 Easily my favorite spot over the two boat trips we did in El Nido was Entalula Beach, a hidden white-sand beach with vibrant blue water and a couple palm trees dotting the coast. I honestly have never seen any beach like it, and we were lucky enough to visit when there were no other boats. We hopped off our own boat onto the beach, and the only people in sight was a Filipino guy selling coconuts filled with rum, and a local fisherman taking his lunch break. I initially had wanted to get to this island during mid-day when the sun was at it’s highest (for the best pics, duh! ), but even in the afternoon this place was serene. Despite being shielded from the sun, it still was my fav photos from the whole day and was the most peaceful too. It’s shielded on either side by tall limestone cliffs, so it truly feels like your own little private beach. Boy oh boy, words can’t do this place justice. Pingabuyutan Island (try saying that 5 times fast, I dare ya), is something straight out of Jurassic Park, with a towering cliff on one side, a beautifully curved beach on the other, and a palm tree forest covering it. Literal paradise. What makes it even better was the waist-high grass that grew between the palms, so it made for a seriously incredible photo session. It was our second-to-last stop of the day, so around 4pm, and the light was absolutely magical. I definitely recommend visiting Pingabuyutan at any point of the day, as it’s a big enough beach where it never feels super crowded, and it’s fun to walk the entire stretch of the beach to see the whole island. We spent a good hour there taking photos, climbing palm trees (or rather attempting to climb them HA! ), frolicking in the water, and playing with the cute beach pups who wander around. This beach was not my all-time favorite of the day, but it’s a great place to end the day due to it’s perfect sunset location. If you’re into snorkeling, there is also some pretty neat marine life around the limestone cliffs, so don’t miss out on that if you visit this spot. You’ll see bright orange Clown Fish (AKA Nemo), beautiful Angel Fish, and some seriously impressive coral. If you’re not into snorkeling, you can just grab a coconut from one of the vendors and sit back to enjoy the sunset. It was the perfect spot to end the day, and although we weren’t blessed with a sky-on-fire type of sunset, it was still gorgeous to say the least. Scroll through to see some of my favorite photos from my Island Hopping adventures in El Nido! And for those of you continuing on to Coron after El Nido, check out my Ultimate Guide to Coron blog to see what I did, where I stayed, what I ate, which island hopping tours to do, and more! And if you’re looking for affordable airfare to or from Palawan (or anywhere in Southeast Asia for that matter! ), I highly recommend you checking out Value Alliance - they have great flight deals on their 6 low cost carrier airlines, and that means you can spend more money on island hopping boat trips - Yay!